If a picture is worth 1,000 words, then children from low-income households would need 30,000 pictures to “catch up” to their counterparts in middle- and high-income families. Research has found that children from low-income families are exposed to 30 million fewer words than their more affluent counterparts by the time they reach age four, a handicap that can follow students throughout the course of their academic and natural lives. This gap, referred to as “the word gap,” is being addressed by local government leaders in Providence, R.I.
“Providence Talks” is the first municipally-driven initiative designed to actively measure (and work to close) the word gap.“Providence Talks aims to empower families with the additional tools and resources necessary to help build their children’s vocabularies from day one, enabling all of our children to enter kindergarten ready to learn and succeed,” says Providence Mayor Angel Taveras. 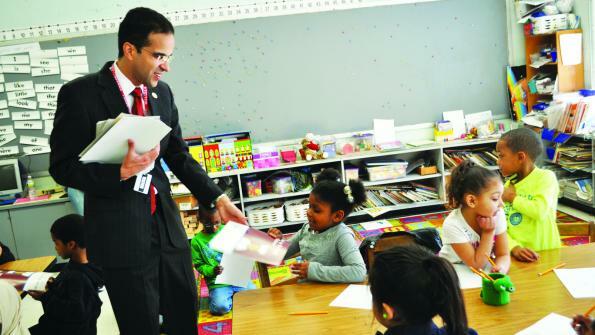 According to Taveras, two-thirds of American kindergarteners show up for their first day of class already behind national literary benchmarks. National data show that children in low-income households hear approximately 616 words per hour, nearly half as many words as heard by children in middle-income households (1,251) and less than one third as many words heard by children in high-income households (2,153). For a child’s vocabulary to develop on an appropriate trajectory, children need to hear at least 21,000 words per day. And while this gap has led to a push for more government-funded preschool programs, Taveras argues such programs are not enough, as researchers from Stanford University found a gap in intellectual processing appearing in children as early as 18 months. “I recognize that we need to really start in the cradle,” he says. Providence Talks is designed to be an early intervention program implemented through in-home family coaching by a team of qualified educators. The project began with a pilot phase that served 75 volunteer families with children aged 3 to 24 months. These volunteers were families previously enrolled in the Early Head Start program. Over the course of several months, volunteers’ conversations were recorded by a “word pedometer” – a small, specialized microphone tucked into the child’s clothing. Developed by the Colorado-based LENA Research Foundation, this device automatically recorded and calculated the number of words the children spoke, and also logged the words spoken in parent-child interactions throughout the day. To protect privacy, playback functions on the recording devices were disabled, leaving researchers unable to listen to actual conversations. The results were independently evaluated in real time by Brown University. In one pilot study, caretakers who implemented the coaching plan increased their adult daily word count by an average of 55 percent – an increase which, Providence Talks hopes, will translate to better word recognition and better academic performance for the child. Providence Talks plans to expand to serve approximately 500 families in 2014 and as many as 2,000 families by mid-2016. According to Riquetti, the success of the project will be measured by the increases in the number of words and conversational interactions heard by children in the program, as well as by kindergarten readiness, and measures of reading proficiency in the third grade. The project was inspired in part by research conducted in 1995 by Drs. Betty Hart and Todd Risley, who uncovered the correlation between family income, household auditory surroundings and success in school and beyond, and by a previous project called “30 Million Words” in Chicago.